The Haws 1011HPSMS Drinking Fountain is a "Hi-Lo" wall mounted barrier-free unit. 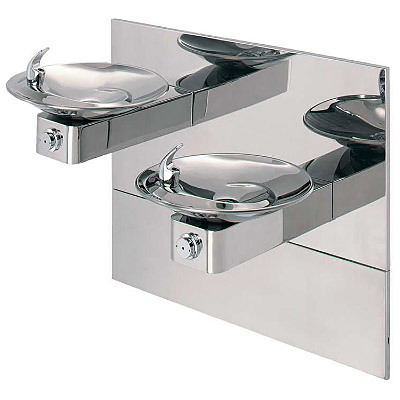 Shall include dual 18 gauge Type 304 high-polished stainless steel finish basins with integral swirl design, 14 gauge Type 304 high-polished stainless steel wall bracket, push-button operated valves with front-accessible cartridge and flow adjustment, polished chrome-plated brass vandal-resistant bubbler heads with integral laminar anti-squirt flow, chrome-plated brass vandal-resistant waste strainers, vandal-resistant bottom plates, high-polished stainless steel finish back and access panels allowing for front access of P-trap and stop, in-wall mounting frame, high and low fountain mounting levels, and 1-1/4" O.D. waste pipes. Perfect for either public or private indoor/outdoor settings, Model 1011HPSMS is a great fit in areas where aesthetics are important to the overall appeal of the architecture. This series is precisely mounted, making it a nice addition to any surrounding. Beautiful high-polished finish helps to maintain the fountains overall appeal so it always remains looking as new as it did when it was installed. Specifically, this type of wall mounted drinking fountain may be placed in settings such as: schools and other locations in and around office buildings where the temperature remains above freezing. 18 gauge Type 304 high-polished stainless steel finish basins with integral swirl design. 3/16" steel mounting plate with supplied mounting hardware provides a solid unit base and allows for easy installation to a framed wall (P-trap and stop require rear access). Haws Part# MTGFR.DF2 - In-wall mounting frame. Model SK3HPS, high polished stainless steel cane touch skirt for installation on high unit to comply with ADA protruding objects guidelines.